Technically speaking, Little is not a body-swapping comedy, in the sense that it does not feature two characters who wake up inhabiting each other’s bodies. 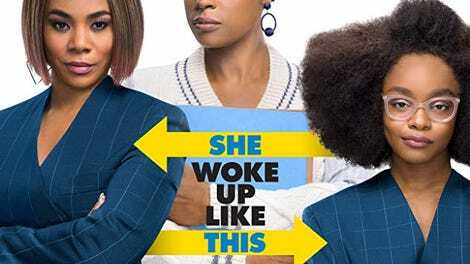 It is, as its title implies, more of a reversal on Big, where high-powered and much-feared tech executive Jordan Sanders (Regina Hall) wakes up in the body of her 13-year-old self (Marsai Martin). Everything else—her luxury apartment, her killer instinct, her packed schedule—remains the same. But on the outside, she’s a gawky teenager again. Probably not coincidentally, 13 was the age where a once-nerdy Jordan first formulated her dominant worldview, which involves using all available intelligence and skills to bully everyone around her before they have a chance to bully her. Now Jordan belittles and mistreats all of her employees, including her long-suffering assistant, April (Issa Rae)—behavior that no adult puts up with from a 13-year-old, leading to zany misunderstandings and the eventual learning of lessons, etc. Much of this is as broad as it sounds, which makes Little’s moments of relative subtlety all the more satisfying, sometimes assuming the quiet-loud dynamics of a well-produced pop song. The movie’s cleverest and mostly unspoken twist is that while April does not swap bodies with anyone, she winds up in a similar role-reversal anyway. When Mini-Jordan turns to her for help covering for her condition as the company preps pitches for a feckless investor (Mikey Day), April has the opportunity to try her hand at running meetings, asserting herself, and acting like a boss; she even helps herself to Jordan’s distinctive wardrobe (featuring great work from costume designer Danielle Hollowell, accentuated by the movie’s bright, popping colors). Jordan, meanwhile, must enroll back in the middle school where she faced adolescent humiliation. It’s an absurd contrivance involving Child Protective Services, but director and co-writer Tina Gordon demonstrates a knack for breezing through absurd contrivances; the spell that turns Jordan little in the first place is just a wronged tween with a pretend magic wand, and that’s all the movie really needs. Similarly, the scene with CPS that forces Jordan’s re-enrollment in middle school—featuring some poorly improvised lies, Jordan struggling to restrain her domineering personality, and a no-nonsense Rachel Dratch—is funny enough to compensate for the necessary leaps in logic. Little moves quickly and can feel a little scattered, with subplots about Jordan befriending a group of middle-school misfits, April’s idea for a new app, and multiple love interests. But the film is grounded by its actors, the key to any body-swapping material. Hall, following up the low-key triumph of her Support The Girls performance, is only in the movie for 15 minutes or so, but she’s enjoyably loose, having fun with the way Jordan just barely masks her cruelty with bravado. Marsai Martin, who came up with the movie’s premise and is a credited executive producer (the youngest in Hollywood history, in fact), is even funnier when she assumes the Jordan role—she has a great moment where she belatedly decides to feign supposed crack-baby jitters, and her disturbingly inappropriate flirtations with her new teacher are perfectly played. But Issa Rae holds the movie together with a delivery style that can go to offhand understatement as easily as an outburst. In either mode, she’s cheerfully likable. On paper, much of the material in Little is not especially worthy of its stars, especially as it slows down for the obligatory life lessons; fleet as the movie is early on, it still manages to run close to two hours. But if the filmmakers get a little over-amped on their own positivity, Little is still self-aware enough to, say, undermine a climactic big-presentation speech obviously intended to convey those sage lessons. (Too bad no one thought to similarly goof around with Hall’s thoroughly unnecessary opening and closing narration.) Jordan and April are both supposed to learn to be comfortable in their own skin. No one can say this confidently crowd-pleasing movie doesn’t lead by example.